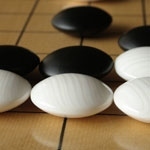 Fuseki is a Japanese go term meaning arraying stones. This normally occurs in the first moves of a game so fuseki is often used as a synonym for opening. Rarely, there are games that have no fuseki, rather fighting begins almost immediately.